I was already an adult when I had my first kinilaw meal in Cagayan de Oro. I must admit; I ate because I was curious. Kagayanon kinilaw looked different from the simple vinegar dipped dish my Cebuano relatives prepared. 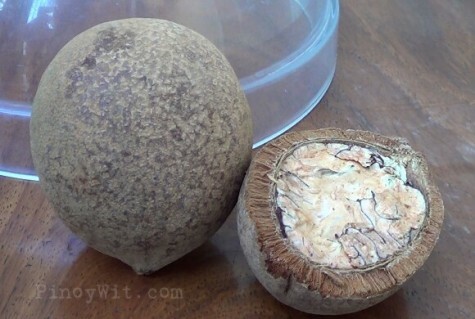 Aside from a whole heap of condiments, Kagayanons also use the juice of the tabon-tabon, a fruit found only in some parts of Northern Mindanao and the Visayas. The fruit juice is apparently able to remove the fishy smell and feel of the fish and can prevent indigestion. To sweeten the dish, my father-in-law’s personal recipe includes using freshly harvested sweet coconut vinegar along with the more sour stocked vinegar. The video below shows J preparing his father’s recipe. 1. Scrape some of the tabon-tabon meat and add a few teaspoons of vinegar. Press the tabon-tabon meat until juice is extracted. Set aside. 2. Wash the fish with a little vinegar. Drain. Do this quickly and don’t overdo. Otherwise, you’ll end up cooking the fish. 3. Add salt, ginger, onions and two types of vinegar. Mix thoroughly. 4. Add calamansi, tabon-tabon juice and lime. Mix. 5. Top with green onions and chili. Serve immediately. All ingredient measurements must be estimated by the person preparing the dish. There are no hard and fast rules, but the dish is best served while the fish is still opaque and not cooked throughout. Want to know more about the dish? Read kinilaw’s origin, history and evolution here. Wife’s Verdict: Eating kinilaw oddly gives me the feeling of carefree abundance. This dish is the manifestation of nature’s bounty and is the offspring of the marriage of freshness and taste. Exquisitely divine. J’s Quip: "Don't let it wait." 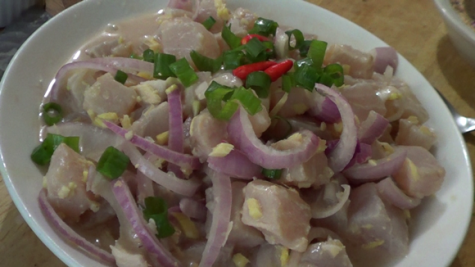 I love how the Kinilaw recipe video was created. Thanks for making this recipe. I know it's worth the effort after.